The Attacknids are the ultimate blasting robotic R/C toy! 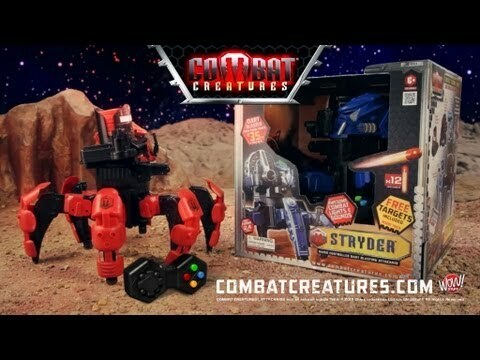 Two versions available, Stryder and Doom Razor. This video is the 2013 commercial. Both Attacknid models are available to buy now at ToysRUs.com! The brand new 2013 Combat Creatures, Attacknids are coming to a store near you very soon! There are two new models launching this year, Stryder comes in in blue. Coming equipped with the Snypa Dart Blaster, Stryder can fire darts up to 50 feet with extreme accuracy! Doom Razor comes in the red, equipped with the Dissector Disc Blaster. This shoots discs up to 30 feet and you can bend them around corners. With a wider impact point these are great for close combat battling! Both Attacknids come with Exploda-Armor on their legs that blast off on impact and an Electronic Battle Brain. Get hit in the brain 3 times and your Attacknid shuts down, there are battle lights to ensure you know how many lives you have remaining and real life battle sounds! This is the brand new TV commercial for these BRAND NEW models! The Attacknids are the ultimate in blasting robotics! Click this link to find out even more about this awesome blasting robot on the Combat Creatures website! ‘Like’ us on Facebook to keep up to date with the brand and be the first to know all Attacknids news and releases as well as other stuff we like to share with our fans! The mini version is cool but iv seen huge 1s of these on a gadget show here in the? uk. How do i get me 1 of those? glad you? like the toy! Glad you like it! It was so cool to see Jaimies robot take its? first step, everyone should go and check that out! So glad to see Jaimie’s Spider tank coming to America! I love the new lights! I’m also stoked that Jaimie’s giant version of this robot took it’s maiden stomp? yesterday! RAWR! Thanks for the support! We don’t have? any plans for a camera at the moment, but the technology is there if you wanted to mod it and add a camera on yourself! YES! So glad Jaimie and you made this happen! Add a camera attachment for telepresence! I would be more interested in a camera than gun. However, I will be buying one? just the same GO JAIMIE! Hi Shotgun Mario, glad you like the video, its been awesome working with Jaimie to create these things? and see how far they’ve come – more to come too!